Despite what your Mother told you, sometimes it's more than okay to play with your food. Meet the Ker-plunk inspired Olive Drop, designed by Ernie Bakker. Olives stand-in for marbles, while cocktail picks hold the party nibbles aloft waiting for the fun to commence! Genius! And it gets BETTER! See that tray at the bottom? 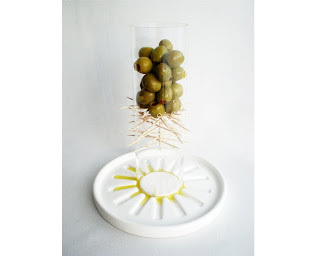 It catches all the drizzling oil from the trapped olives creating the perfect spot to dip your bread or other appetizer treats. Neat & tidy, foodie fun! Actually, that looks like a super fun drinking game!